In 1974, Frenchman Philippe Petit fixed an illegal wire between the two World Trade Center towers. He then walked and danced on this wire for 45 minutes. 1,350 feet above ground, Petit didn’t have so much as a safety harness - because that would be cheating. 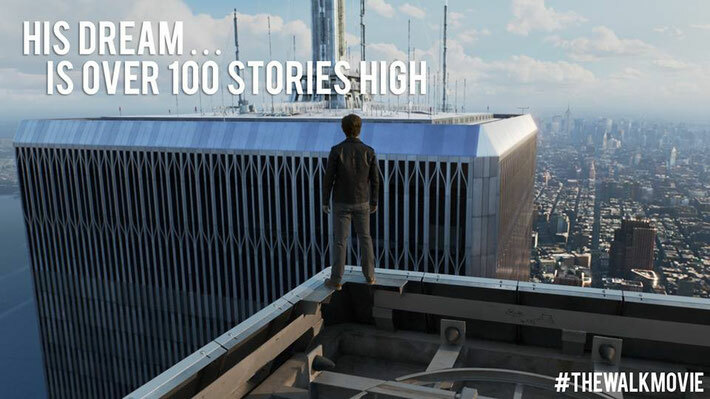 As I write this review, I am not long back from watching The Walk at my local cinema. My heart is still pounding as a result of the stunning movie I have just experienced. If you fancy this film, do go and see it on the big screen. And, while I am no fan of 3D, for this film I made an exception and I would suggest that you do too - it is well worth it. I loved The Walk. It is a truly remarkable film. However, at the beginning, I did wonder if I was going to enjoy the telling of Petit’s story. The film starts with a close up of Joseph Gordon-Levitt’s head. I found this rather startling - particularly in 3D. He is sitting atop the Statue Of Liberty looking out to a New York skyline that includes the two towers of The World Trade Center. From this quite stunning position, he begins to tell his story. Gordon-Levitt is wonderful as Petit. His accent did wobble but there were also times when he was eerily spot on. He brings a twinkle to his performance that evokes the charisma of the real Petit. In the first part of the film we learn how Petit first started wire walking, how he met his girlfriend Annie (Charlotte leBon) and how he managed to recruit “accomplices” for his ultimate wire walk - or coup as he calls it. I have recently watched the documentary about Petit called Man On Wire. I felt that this film covered the start of the story more effectively. The Walk felt sluggish at times and a little silly. I began to feel impatient to get to the walk of the film's title. It is, of course, when the day of the coup arrives that The Walk comes into its own. This is what we have come to see. At one point, Petit stands on the ground and looks up to the top of the Towers. The camera then races up the side of the building at dizzying speed. Everyone in the cinema around me took a sharp intake of breath as the scale and majesty of the Twin Towers is recreated. The film then swings into exciting heist mode as Petit and his accomplices transport all of their wire walking gear up to the top of the two towers - a significant feat in itself. Now, full disclosure, I’m scared of heights. However, I knew all would be fine in the end. So, tell me why was I curled in a ball, hanging on to my seat for dear life? Why was I almost unable to watch as Petit ran around the roof of The World Trade Center? Why did I have to remind myself to breathe? The answer is that director, Robert Zemeckis, makes you feel as if you are up there on the roof with Petit. It is such a remarkable piece of film making. It just feels so incredibly real. Strangely, when Petit takes his first step onto the wire, I didn’t feel as anxious. Instead, I appreciated the beauty of what he was about to do - it felt magical. Every now and then I had to remind myself that, yes, this actually happened. It didn’t take long, however, for my anxiety to return. Again, even though I knew that Petit would be fine, I just wanted him off that wire! I felt a huge sense of relief when he and his sore feet were back on solid ground. In the final moments of The Walk, Petit explains what happened once his coup ended. This is when the thinking behind his Statue Of Liberty position becomes clear. For as much as The Walk is about Petit’s amazing feat, it is also a tribute to those two magnificent towers. The film reminds us just how important and truly majestic they were. The documentary, Man On Wire, does not nod to what happened to the towers at all and I felt that this was the right decision. However, in its final moments The Walk pays a delicate and sensitive tribute to the towers and lets us feel their loss. As a result, I left the cinema both exhilarated and deeply moved. Man On Wire does not explore Petit’s relationship with Ben Kingsley’s Papa Rudy. I did wonder why The Walk chose to include this part of the story as seemed to me to hamper the pace of the film. Why did they make Joseph Gordon-Levitt wear that terrible wig? I found it quite distracting. It wasn’t even like hairstyle of the real Petit. Odd. 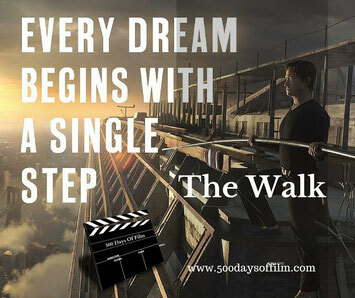 Have you seen The Walk? What did you think about this film? I’d love to know so do feel free to leave me a comment in the box below. I saw this film just an hour ago, and i loved how it made you feel like you were up there with him.